Please note: this event recap is taken from the proceedings of the Melbourne event. Per Capita also held an event with David Madland in Sydney, where different topics may have been discussed. 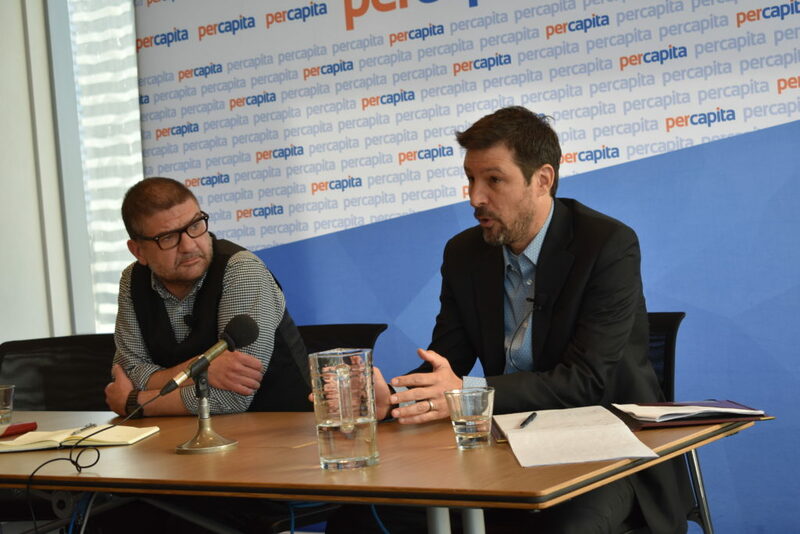 The latest guest at Per Capita’s Reform Agenda Series was David Madland, in conversation with Tim Lyons. David Madland is a Senior Fellow at the Center for American Progress. He has written extensively about the economy and American politics on a range of topics, including the middle class, economic inequality, retirement policy, labor unions, and workplace standards such as the minimum wage. Madland is also the author of Hollowed Out: Why the Economy Doesn’t Work without a Strong Middle Class. David began the session with a breakdown of the organised labour and workplace regulation context in the United States. While Australian workers have been hit hard by stagnant wage growth over the last decade, American workers have been dealing with stagnant wages for 40 years. In the US, you have to go up to the 95th percentile of earners to see any wage growth at all. While CEO pay in the 1970s was 30 times the average worker, it’s now 300 times higher. Union density is extremely low and there is significant political capture, with elites controlling government. This labour context is, he argued, at least partially responsible for the election of Donald Trump. In Australia, David and Tim agreed, there are positive prospects compared to the US. We have a strong minimum wage, and a structure in place to at least move towards industry-wide bargaining. But while our position is slightly improved, there are concerns we are heading in America’s direction. Our significant underemployment and low labour force participation is comparative to the American context, and our workers are experiencing a similar pattern of downward mobility. The discussion then moved to enterprise bargaining, essentially the same as firm-level bargaining in the United States. David described firm-level bargaining as “failing terribly across the US”, because firms “shapeshift to get out from under” it. 94% of workers in the US have no way to bargain, a future Australia must try to avoid by shifting to industry-wide bargaining. David and Tim discussed how the evidence points to increased productivity where industry-wide bargaining is the norm. How do we design a model that works for different parts of the economy? That was the next question on the agenda. Tim and David argued that the labour movement has to make sure the system works for “both cleaners and construction workers”, i.e. not just for the workers that already have power in the system. David was clear that “the government has to be on the side of the workers” for systemic change to happen. Both the United States and Australia are federal systems. In the US, significant change has been seen at the state or city level, because while bargaining and union law is national, minimum wage and other labour laws are the realms of states and cities. David argued that “state and local experimentation” is absolutely key to reforming labour laws. Although states do not have as much leeway in this space in Australia, Tim and David agreed that there were some things states could try: for example, changing the laws regulating an industry so that it can become more organisable, or setting prevailing wage standards for state government procurement contracts, or more strictly enforcing wage theft laws. Want to make sure you get tickets for Per Capita events? Subscribe to our newsletter today.